With his Heisman Trophy win official, Robert Griffin III cards are among the hottest in the hobby. This, despite that he doesn't have any official, commercially available cards. But that's not stopping some from cashing in and filling a market void.. 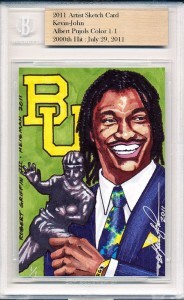 The closest thing to official Robert Griffin III cards come directly from Baylor University. Throughout the season, the school produced a set of five cards in support of RG3's Heisman campaign. The cards were intended for Heisman voters and media, but that hasn't stopped a couple from making their way on to eBay. In September, a card showing Griffin in the midst of a pass closed at $127.50 on 18 bids. 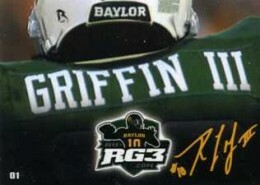 The first card Baylor sent out, showing the back of Griffin's jersey and helmet, went for $100 on December 14. Another copy of the card closes tonight. It's sitting with a $75 bid. A couple of last-second snipe attempts wouldn't be surprising. Because they were produced by Baylor, these Robert Griffin III cards should be considered official cards, much like one would an oddball set. They're also notable because they're forever connected to a Heisman Trophy win, so they have history behind them. These cards could become some of the most sought after and valuable Griffin cards over time. Media swag isn't all that uncommon, however, it can be tough to find on the secondary market. If they even survived, many of these cards were likely tossed in a desk and will never see the light again. Others were probably passed on to nieces and nephews. Combine that with the fact that the cards aren't intended for resale and you've got a perfect storm of factors that will ensure the scarcity and values of these cards over the long-term. Another popular source for Robert Griffin cards has been personal sketch cards. Depending on the art's quality and the popularity of the artist, sketch cards have sold for as low as $1.00 and gone all the way up to a staggering $454.99 for a Kevin John card that closed on December 17th. Collectors should look at personal sketch cards more as art and less as sports collectibles. Unless they're part of a licensed set or endorsed by the player, they shouldn't be seen as official pieces of memorabilia. That said, there are many talented artists out there making fantastic pieces of artwork. Like anything that holds value or gain notoriety, there's plenty of bootleg Robert Griffin III cards collectors should avoid. eBay is littered with such cards. Although some carry nice designs, they're little more than someone playing around on their computer and having them printed, either at a small print shop or on their home computer. The use of slabs don't add any legitimacy to these cards. They're unlicensed bootlegs that hold no legitimate collectible value or long-term growth potential. Although Andrew Luck is still the consensus number one pick in the 2012 NFL Draft, Griffin III is expected to be a high first round pick. As such, expect a ton of cardboard love for the 2011 Heisman Trophy winner next season, both from collectors and manufacturers, as we get our first taste of NFL Robert Griffin III cards. RG3 will be next year’s Cam Newton! 2012 Score #2 Robert Griffin III RC Washington Redskins Rookie Card!